In the approach to the 100th anniversary of the First World War armistice 3,500 cadets and adults from around Great Britain took part in a unique battlefield tour. The trip involved five groups of around 700 cadets and adults, travelling over to France between 19-29 October. Find out more at the Army Cadet Armistice 100 webpages. Before undertaking the visit the cadets were asked to research their family history to understand more about their own families’ 100 year journey from WW1 to present day. Their research helped them to understand the roles their relatives played during WW1, find out more about local heroes who deserve to be remembered and gain a greater appreciation of the freedoms they enjoy today. During the visits, each group of cadets got the opportunity to talk to experts about the causes of WW1, the course of the War, technology (including tanks, mines, aircraft, artillery and radio), media, medicine and commemoration. Each visit culminated in a commemorative parade at the Thiepval Memorial. 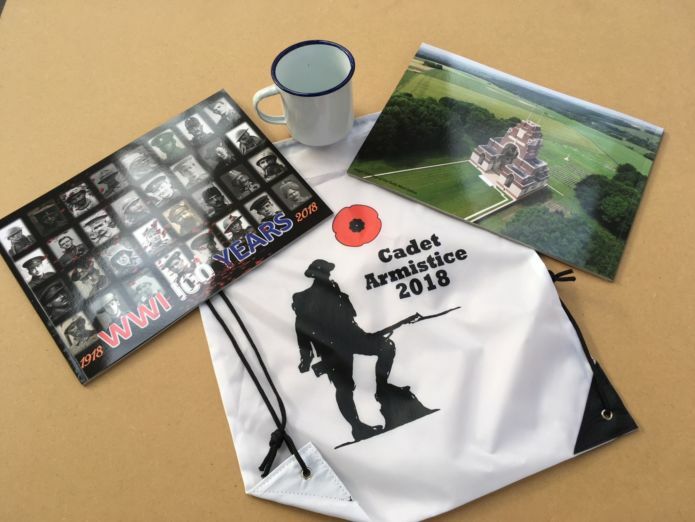 To help the ACF and CCF (Army) cadets to remember the trip each cadet received a commemorative pack including a specially produced book explaining the background to WW1, the course of the War and other key facts. Find out more at the Army Cadet Armistice 100 webpages.